18. 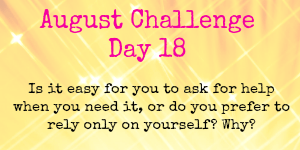 Is it easy for you to ask for help when you need it, or do you prefer to rely only on yourself? Why? I don’t know why, but I do tend to find it hard to ask for help. Maybe it’s for fear of being seen as weak or incapable [of doing something] and I really don’t know where that had stemmed from. It’s not as if I don’t have support system from my family and hubby as I do, I thick it may be more to do with me feeling helpless in needing help. For example when I suffered the PND after Jack, I found it hard to ask for help then despite knowing that how I felt wasn’t normal, but I thought that by me asking for the help I was going to be seen as a failure or a bad mum. Some trait that I need to change about myself, as I know it’s on to ask for help it’s letting go and actually asking that is the hard part for me.